Marketing your business effectively can be an overwhelming concept. But you don’t need expensive campaigns to drive people to your business. In fact, there are numerous cost-effective marketing tools that you can use to start boosting your brand and attracting new customers. Whether you run a restaurant, a retail store or something entirely different, here are six tips for marketing your small business on a budget. Social media is one of the most powerful marketing tools you have at your disposal – and it’s free. When used effectively, social media can dramatically increase your brand presence. All you need to do is analyse which social media platforms will be best for your business, set the accounts up and then regularly post relevant content. Make sure that your content is professional – including copy and images – and that it presents your business accurately and with personality. Once you have your social media profiles set up, encourage friends, family and customers to like your pages. You will gain more followers by word of mouth, using hashtags and even by offering customers incentives (like free products) for liking your page and sharing your content. Want your social media presence to be as effective as possible? For more information, you can check out this blog post on 5 Ways to Strengthen Your Social Media Profiles. A blog is essential if you want your business to be discovered online. Having a basic blog that features interesting, relevant and professional content (like recipes, posts about upcoming events, articles about current affairs – whatever you think your customers will find enticing) can dramatically increase your website’s traffic. Once you have a blog set up, make sure to promote your blog posts on your social media accounts. Partnering with other complementary businesses is a great way to tap into new customers. For example, if you sell flowers and there is a handmade card store down the street, it makes sense for you to refer customers to each other. Building a partnership markets your products or services to the customer base of another business, and vice versa. This tactic works particularly well for local businesses, as it fosters a sense of support and unity within the community. The first step for this tactic is to consider which businesses complement your own, and which businesses you believe your products or services could add value to. One free marketing tool that every business has access to is networking. Networking is one of the most effective marketing strategies out there. Where you network will depend on your business type, but a great place to start is local business groups on Facebook, local events that are relevant to your products or services, and LinkedIn. Having a LinkedIn profile is important for keeping track of the connections you make and discovering new networking opportunities. According to Invesp, 90% of consumers read online reviews before visiting a business, 88% of consumers trust online reviews as much as personal recommendations, and 72% of customers will only take action after reading a positive review. Are you getting the sense of how critical customer reviews are yet? What your customers have to say about your business is the clearest indication of your customer service – your reviews can mean the difference between success and failure. 1) You ask your satisfied customers for reviews on sites like Facebook, Yelp and Google. 2) You respond to negative or neutral reviews promptly, professionally and proactively. Some businesses make the mistake of deleting negative reviews. You should not do this. Rather than seeing negative reviews as a problem, view them as a fantastic opportunity to improve your business and show your customers how you handle all sorts of customer experiences. Also, never purchase positive reviews – customers can often tell whether or not a review is genuine. Want to make getting customer reviews as easy as possible? Check out this Review Handout Generator by White Spark. Google My Business is a Google account that any business can sign up for (it is completely free). Once you sign up, you will need to fill out your business information like your address, description and contact information. Once you are all set up, your business will appear when someone uses Google Search or Maps to perform a geographically based search (for example ‘Italian restaurants Brisbane City’). This can really improve your online discoverability. Interested? Find out more about Google My Business. If you have any questions about the content in this post, don’t hesitate to contact Studio Culture. We specialise in a range of digital marketing services for businesses throughout Australia. Also, if you are a part of a competitive food business industry, you can use this opportunity to benefit from more fantastic restaurant marketing tips enormously. 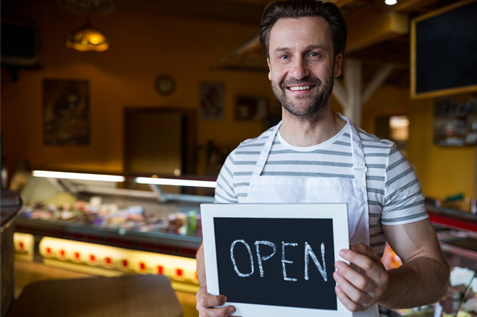 Check out this Restaurant Business Plan and use the ideas Alsco experts compiled for you to boost your business today.